With the help of The Healthiest Home in Ottawa, a couple in Aylmer, Quebec are the first in the National Capital Region to build a home with an innovative wall panel system from a U.S. company called K-Tect. Ecohome April 20, 2012, 2:43 p.m.
Brian Allemekinders and Deidre Yukich say that despite their new home being twice the size of their previous home, it consumes half the energy to operate. With a passive solar design, airtight building envelope and no thermal bridging, this family enjoys an energy-efficient home with superior indoor air quality. 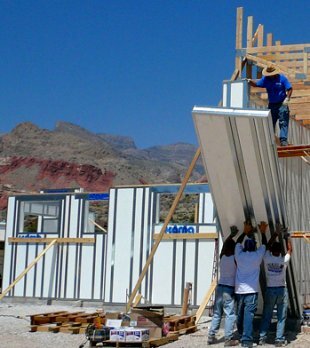 Structural Insulated Panels (SIPs) are fairly common in the building industry, and refer to prefabricated wall sections that comprise the building structure as well as the insulation. Largely due to the performance as well as speed and ease of SIPs installation, new players regularly enter the market with a variety of designs and materials. K-Tect is based in Las Vegas, Nevada, and The Healthiest Home in Ottawa will be the dealer for eastern Canada. In contrast to most SIPS, this panel contains no wood. Instead the structure is made of light-gauge metal studs with an EPS (expanded Polystyrene) foam-filled cavity. The metal does not pass through the wall panel, so there is no thermal bridging to cause heat loss. Foam insulation products have long been in the grey area of green construction. Foam is a petroleum-based product that until now has either had a significant impact on ozone depletion or high greenhouse gas emissions during production. However, given their durability and performance, they remained in the realm of green building products. What K-Tect offers is a similar quality product with an R value of 4 per inch, but according to the company, their product uses less raw materials than competitors, and greenhouse gases are mechanically removed, captured, and used to power production. “The pentane gas is extracted from the foam beads and used to power the machinery, creating a closed-loop system with a final product that has no off-gassing to affect indoor air quality” Says Ken Miller, owner of K-Tect. With the elimination of off-gassing, K-Tect panels are GREENGUARD Certified (a rating system of indoor air quality) and were part of Utah’s first ever LEED Platinum Certified medical building. The panels are resistant to insects, rodents and moisture, and have a superior fire rating. With continued exposure to flame, the panels melt and only release carbon dioxide. With both the foam and metal being 100% recyclable, it is unlikely the panels would end up contributing to landfill at the end of their lifecycle. Having addressed two major concerns of foam as a building material (greenhouse gases and end product off-gassing), this could hopefully spark some changes in the industry. Foam insulation companies have put a lot of effort into marketing their products as green, so it is nice to see the product catching up to the reputation.